The countertop material you choose can have a direct impact on the finished look of your kitchen. With the wide variety of styles and colors available, it has never been easier to personalize your kitchen to meet your unique design preferences. If you are considering remodeling your kitchen, TimCo Construction can help install your perfect countertop material from several trusted brands. In recent years, Formica countertops have skyrocketed in popularity because of their ability to mimic expensive stone countertops while remaining affordable and easy to maintain. 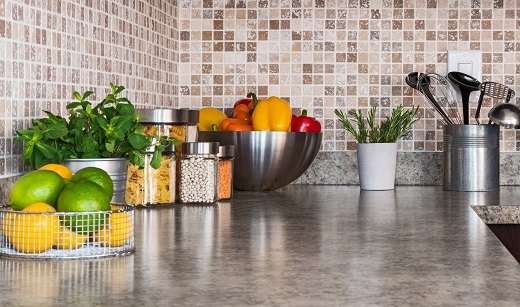 Formica, a laminated composite material, was invented in 1912 for electrical applications but has since become arguably the best countertop material for both commercial and residential applications. Formica is by far the best value for homeowners that are looking to get a great countertop without the expensive price tag other materials carry. Wilsonart® Countertops come in many different styles, including laminate, quartz, and solid surface. Whether you are looking for rich textures or a splash of color, Wilsonart® likely has the perfect solution to meet your individual needs. With a wide variety of custom design options paired with the excellent performance enhancing technology of these countertops, you can be sure your countertops will remain durable and beautiful for years to come. LG Hi-Macs® are manufactured to provide homeowners and business owners a low-maintenance, luxurious countertop option at an affordable cost. Utilizing sustainable materials, LG Hausys helps support a greener earth while maintaining an eco-friendly manufacturing process. Even if your countertops crack, scratch or stain, they can be easily repaired to their original beauty by a certified professional. Why TimCo Construction for Countertop Installation? TimCo Construction is committed to providing the highest quality countertops possible to Tulsa and the surrounding area. If you are in need of a new look for your kitchen or bathroom, TimCo Construction would love to explain our excellent remodeling options in greater detail. To find out more about our remodeling options, contact us, or give us a call at 918-779-7330. Next Next post: What Are Your Kitchen Needs?